If you are a peanut butter lover, you have to try my Peanut Butter Chocolate Trifle and those who are OREO obsessed like my husband, then this OREO Brownie Trifle is to die for. But if you aren’t a chocolate lover (hey mom!) 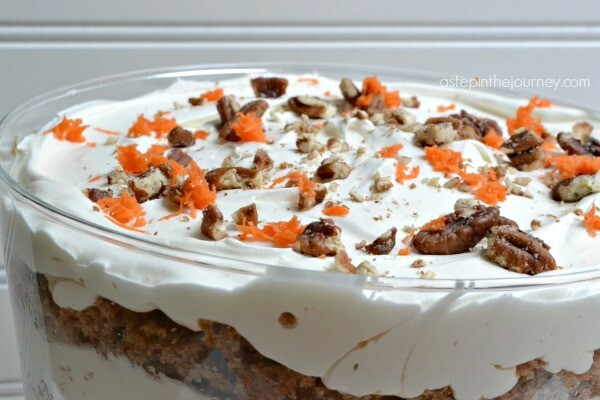 then this Carrot Cake trifle is about to rise to the top of your favorite dessert list! Promise. As you might can tell I LOVE a good trifle. However, I don’t always have a great reason to make such a huge dessert, so when the opportunity does present itself I always jump. Last week my Sunday school class got together and each of us brought different parts of the meal. I brought dessert! This trifle turned out absolutely fantastic, and I couldn’t wait to share it with you! Let me explain a little more about the goodness that is a trifle. They are like cake, but not exactly….it doesn’t come out in a nice clean slice, more of a glob so grab a spoon. The cake stays super moist since it’s surrounded by other creamy goodness. AND you get the perfect cake/icing combination in EVERY bite. It won’t last long at any party! So let’s get to it! Prepare the carrot cake recipe as instructed (I like to add shredded carrots to the mix to make it feel a little more authentic) in a 9x13 pyrex baking dish. Allow to cool when finished then cut into cubes. For the whipped mixture: Using an electric mixer on medium/high speed cream together the softened cream cheese and butter until it becomes light and fluffy. This will take 3-5 minutes and you will need to scrape down the sides. Turn the mixer down to a low speed and add the powdered sugar 1/2 cup at a time until combined. Pour in vanilla and mix for another 2-3 minutes as it continues to fluff. With the mixer still on low add the Cool Whip a little at a time until everything is combined. In a trifle bowl or deep glass bowl, place in one layer of carrot cake pieces/crumbles. Then add a layer of your whipped cream cheese mixture. Repeat ending with the whipped cream cheese on top. Add the crushed walnuts or pecans to the top and refrigerate until it's time to serve. 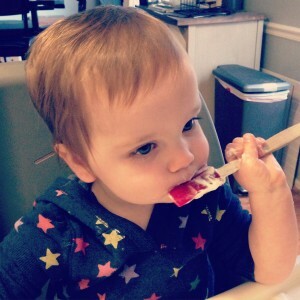 Chickadee LOVED licking the whipped cream cheese spoon after all was said and done! And I even felt okay letting her have a little bit after dinner because after all it’s a “veggie dessert” right? If you are feeling really adventurous, and have the time, this dessert would look really cute layered in individual mason jars. A perfect Easter dessert/gift too if you ask me! Made this just to try it out – and it was so delicious! And so easy! Definitely gets better the longer it sits in the fridge too. Mmm! I made this today as your directions. The filling was super yummy, but not enough to do 3 layers in my trifle bowl unfortunately. Also the carrot cake mix I don’t care for. 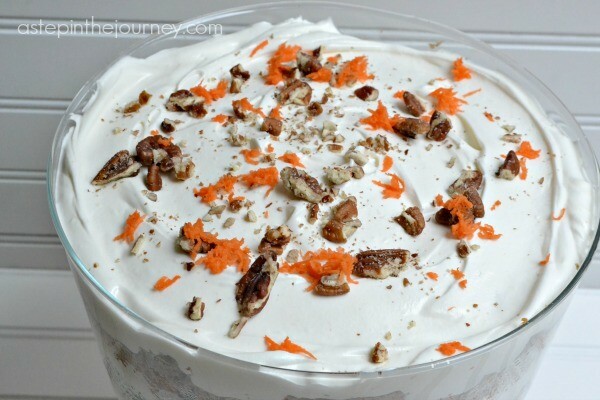 I think I will try this again with homemade carrot cake and use a rectangle glass baking dish. Homemade carrot cake sounds delicious to me!! I am making this tomorrow for our Easter dessert! We are going to share on our blog tomorrow when I make it, linking back to your site for the actual recipe! My husband loves trifle and is really looking forward to this tomorrow! Can you make this carrot cake truffle the day before ? 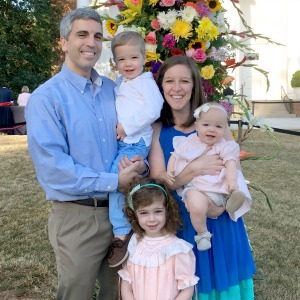 Thanks plan on making for Easter. It gets better with time! How far in advance can you make this? Could you put it together the night before for an afternoon gathering? Or would it get mushy? 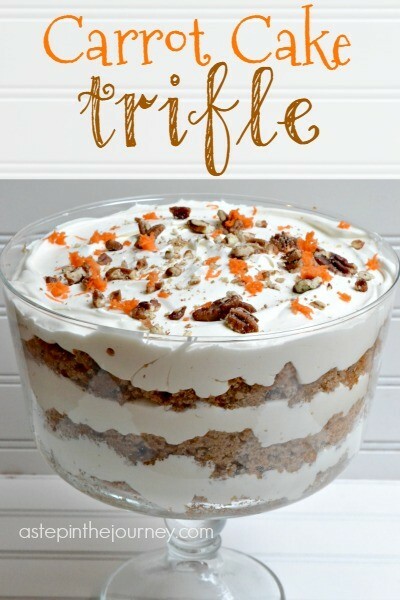 Such a wonderful looking dessert idea – I never thought to do a carrot cake trifle! 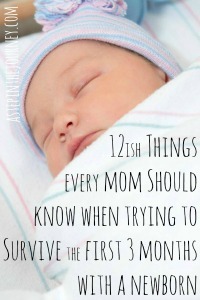 I shared this in a recent blog post that I linked back to your site. I can’t wait to try this one. Thanks for the inspiration. 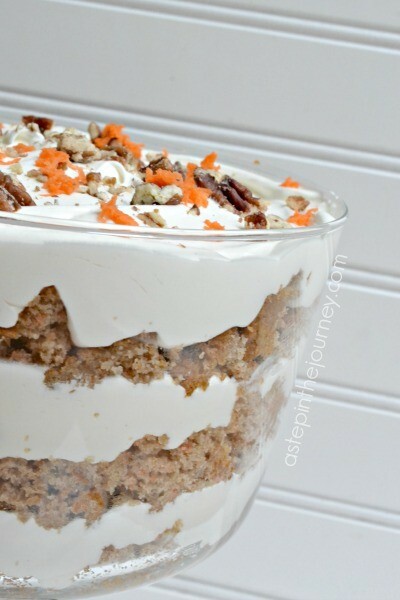 wow what an amazing idea – a carrot cake trifle! Looks great and I’m sure it tastes amazing too! I shared it as a link on my blog since it is one amazing recipe. I’ve bought it as Walmart & Publix. I hope that helps! I made this using a homemade carrot cake made with baby food carrots. Have made this recipe for 35 years and everyone loves it. I made it in a bar pan so the carrot cake would’t be too thick. Layered with the cream cheese, cool whip mixture and sprinkled homemade candied nuts on top. It was a huge hit!!. Could be add some king of liquor to it?. Like the Kahlua cake recipe?. Ooh! This one looks delicious!! :) Thanks for sharing! Thanks for sharing this looks delicious. I can’t wait to make this. I wonder if adding some crushed pineapple would make it taste like J Alexander’s Carrot Cake …. Ooooo…I’m not sure but it’s worth a shot! Sounds delicious! Love the option of a no chocolate dessert! I hope you have some left this weekend! !